The Battle of Agincourt: An Alternative Location? Abstract: The recent publicity surrounding the proposed construction of a wind farm close to the Medieval Agincourt battlefield in France has provoked an outcry suggesting that, once again, a European historic battlefield is at risk. A recent archaeological survey on the Agincourt battlefield has, however, failed to find positive artefactual evidence of the conflict on the officially designated battlefield site. Using the available historical and archaeological data from Agincourt and evidence from the successfully surveyed Medieval battlefield at Towton, England, an interpretation can be proposed, which highlights an alternative location for the French-English battle of 1415. Unfortunately, if this hypothesis was confirmed it is possible that, in attempting to protect an incorrect site, the correct site is more likely to be left unprotected and might eventually be destroyed. Introduction: On 27 January 2004, the Daily Telegraph newspaper published a letter from the actor Robert Hardy MBE, an authority on the English longbow. The letter highlighted the proposed construction of a wind farm on the site of the Battle of Agincourt, France, fought between the English and French on October 25, 1415. Sir—The préfet of the Pas de Calais has received a planning application to build a wind farm on the edge of the battlefield of Agincourt. Each wind turbine would be more than 400 ft high, roughly half the height of the Eiffel Tower, and certainly four of them, to be sited on the left of the English position at the battle in 1415, would dominate the whole field. In order to prevent the proposed development, many individuals and groups were mobilised into action to protest against the wind farm. It was not long before the British and French media were covering the protests of those who purported to have the protection of the battlefield landscape at heart. However, as is the case with many early historical battlefields, it has not been archaeologically confirmed where the site of the battle lies. It is therefore possible that most people were overlooking the most serious threat to the battlefield: if the actual site has not been proven archaeologically, then how can one protect all, or part of it? Indeed, the real site might lie in a different location? In order to prove the whereabouts of the actual site, all available resources should be employed, not just the analysis of historical documents. As the threat to any physical aspect of the battlefield would involve the disturbance of the ground surface or sub-surface, then the issue is primarily one of archaeology and not simply of history. Although there is a great deal of historical evidence relating to the battle, this provides possible conjecture as to its location. There is, however, arguably no archaeological evidence for the site of the conflict, which is unfortunate, as this would authenticate only a single site. In her comprehensive book, The Battle of Agincourt: Sources and Interpretations, Professor Anne Curry states that, ‘There is no dispute about the location of the battle’. 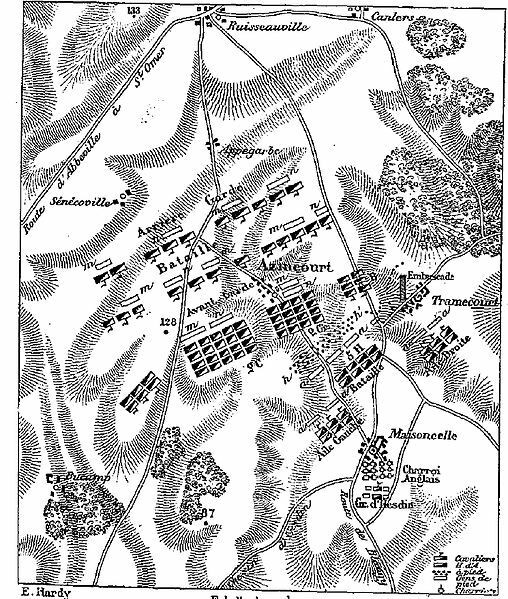 This is a bold statement, and so, in order to stimulate discussion, this paper will illustrate how selected historical information can be used to highlight a particular point of view—in this case, an alternative location for the battlefield. The validity of this view can be verified or disregarded by carrying out an archaeological evaluation of the battlefield.